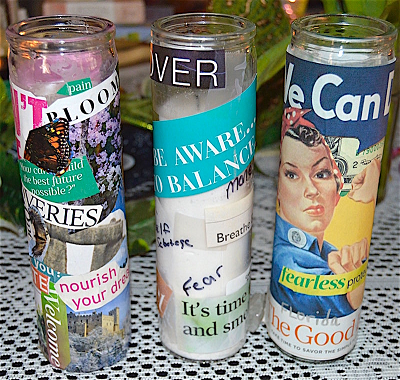 This year for the new moon in Pisces I made dream candles. I was inspired by a ritual in the book I reviewed, “Moon Power: Lunar Rituals for Connecting with Your Inner Goddess” by Simone Butler. I later modified her ritual for Ostara where some participants changed it to meet their own visions, so do revise it so it works for you. 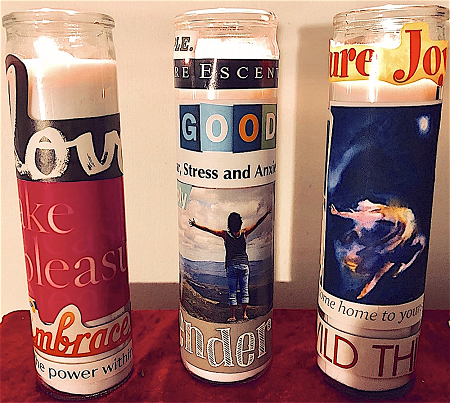 Pisces is dreamy, making it a wonderful influence for letting your subconscious choose images and words to glue to a seven-day glass pillar candle. Candles can also be made for a particular intention. You can find them at the dollar store. Any color you are drawn to is fine. I made three to burn consecutively, each representing a phase of a transition I am experiencing. When modified for a group craft and Ostara ritual, the objective was to put a representation of what you want to achieve on the bottom of the candle, and above that, anything that needed releasing. As the candle burned, it would burn away that which was no longer needed so the wish would be fulfilled. We placed them on the altar, lit them, then danced and drummed to raise energy that sent up our intentions. Butler directs you to get comfortable at a well-lit table on which your candle, images, scissors and glue are laid out, turn on hypnotic music, close your eyes and ground yourself with a few deep breaths. Then let your dreamy mind choose the images and how they will be arranged on the candle. When it feels complete, place it on your altar and light it, raise some energy by dancing to send your desires up with the flames. Her ritual incorporates Sedna, goddess of the sea, whom she introduced in the pages preceding this ritual. Afterwards, Butler suggests taking a ritual bath with lavender oil, and drinking herbal tea or wine before going to bed and slipping into the dreamworld. While this spell candle can be made at any time, if you seek the influence Pisces, know there will be full moon in Pisces September 14, 2019 and a Pisces new moon February 23, 2020. Because the moon moves through the astrological signs every two to two-and-a-half days. It will be in Pisces from about 11 a.m. EDT April 1 until about 11 p.m. April 3. then again April 29 and 30. and May 27 until about 2:30 p.m. May 28. We’Moon along with other calendars and websites can give you moon sign information.